Skype is a great way to communicate or record a presentation. If you are presenting at a conference or a meeting, being able to patch into a sound system to use a lavalier or handheld microphone during your Skype all can be very beneficial. This can allow others in the meeting room to hear the call and those in the remote location to listen. Skype can also allow you to record your call for archive purposes or later listening. To accomplish this you can use several methods. One way is to use a USB device that can be plugged into a laptop. From an Audio Visual standpoint, you want to do what they call a “mix-minus” feed. A “mix-minus” feed prevents audio loopback, which if not set up correctly can cause an infinite audio loop that causes one to hear themselves over and over again. It can make the call unintelligible. In this article, I will show you how to set up a Skype call or conference call through a sound system using wireless microphones and a “mix-minus feed”. Your first step is to download Skype. Skype allows you to make free video and audio calls to anyone in the world either one on one or group calls. It requires you to download their software or app. If you are looking for more features Skype for Business will allow you to record your calls and is great for larger groups. In this particular setup, we will be using a laptop to make the Skype call. Next, you need an interface box that will allow you to pass audio to and from the mixer or sound system that you want to patch into. A USB audio interface mixer works well for this application. This interface plugs into a USB port in your laptop. It will also allow you to plug in a microphone or send an auxiliary feed from another soundboard into it. The Alesis IO2 Express works well for this type of setup. Two-channel computer audio recording interface comes complete with a copy of Steinberg Cubase LE digital audio workstation (DAW) software. The Alesis IO2 is available from these retailers. Other USB Audio Mixers that would work. First, you want to use an Aux send or Effect send feed to the line input of the Alesis device. Most quality mixing boards have these outputs. For most soundboards, this is a 1/4″ output. This step will allow all of the mics that are plugged into the soundboard to be broadcast through the Skype call. If you are using a single mic you can also use the mic input of the Alesis IO2. 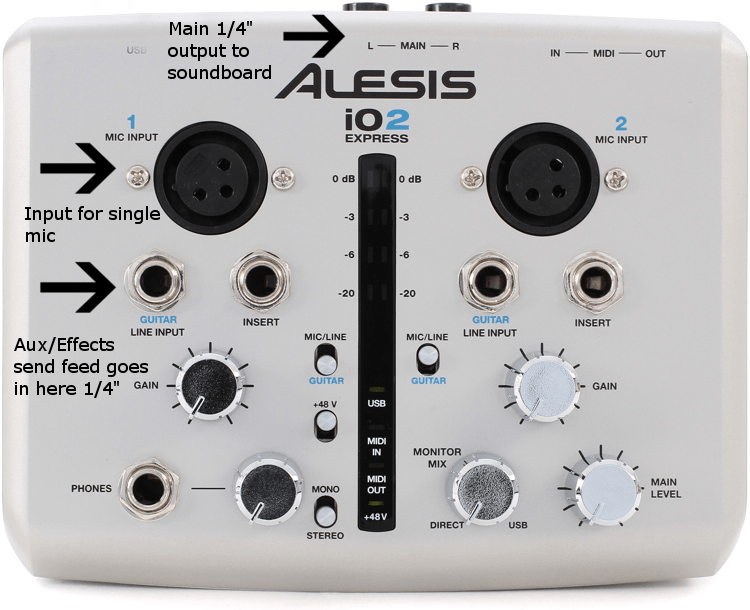 Once you have the 1/4″ cable plugged out of the Aux/Effects send bus into the Alesis IO2 line input you can now proceed to set up the return feed. 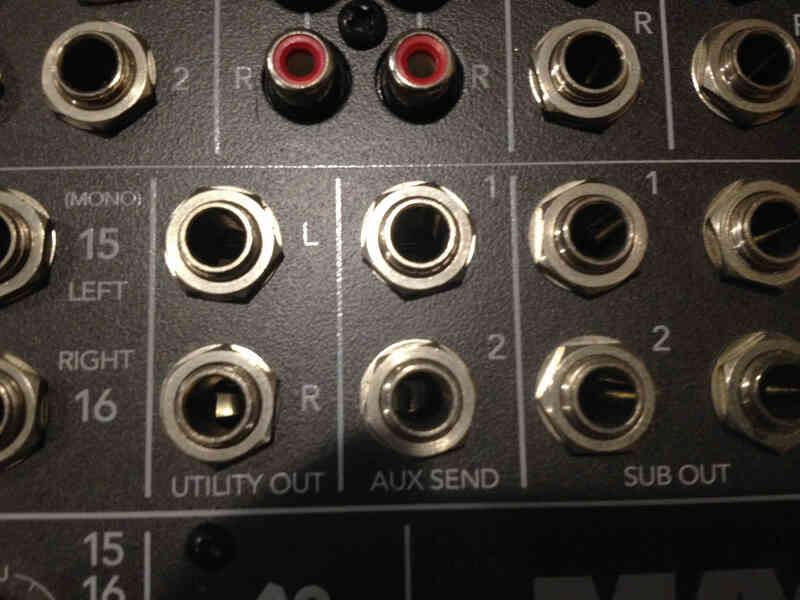 On the back of the Alesis IO2 are two 1/4″ main outputs. 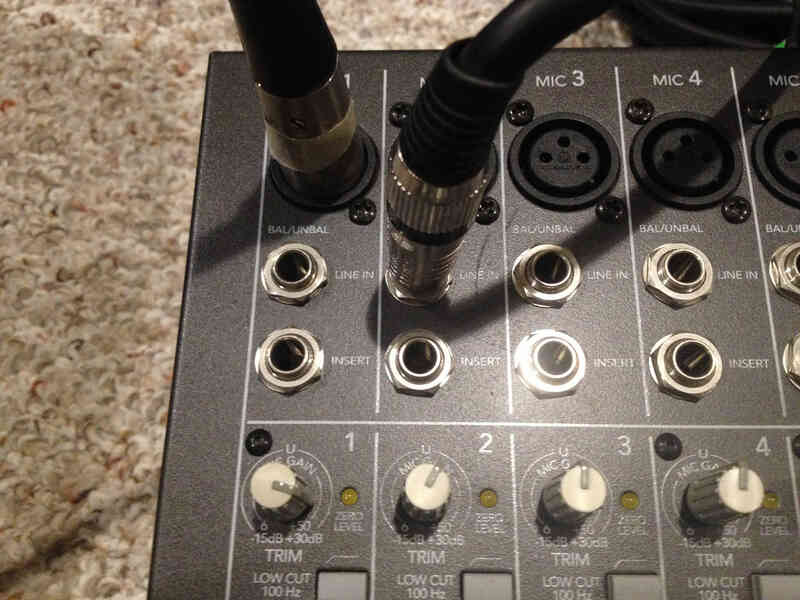 Using a male 1/4″ to 1/4″ cable plug one end out of the left channel into a free 1/4″ input of the soundboard. Make sure you are plugging into a 1/4″ line input and not an insert input. This process will allow the person on the other line of the Skype call to be heard through the sound system. This is an important step that often gets overlooked or set up improperly. A mix-minus feed only allows the mics to be sent to the Skype call. You do not want the feed of the incoming call to be set back to the caller. This will cause an infinite loop or echo which can make the call unintelligible. Using the Aux/Effects send knobs on each input of the soundboard make sure that only the mics knobs are turned up on each of the mics you want to send to the Skype caller. The return 1/4″ input should have it’s Aux/Effects feed turn off. This will prevent the loopback feed. Also, make sure that your Aux/Effects feed main output knob is turned up. You may also want to check that your feed is being sent post and not pre-fader. Some soundboards have a switch by the Aux feed allowing you to choose. Now that you have your feeds set up. It is time to configure the Alesis IO2. Start by plugging in the USB cable into your laptop from the Alesis IO2. Power will be provided by the USB cable. Your laptop should recognize the device. If you look in your sound card settings, you will see the device marked as IO2. Launch Skype and sign in. Then go to the menu bar and open tools then options and audio settings. There you will find options for your microphone and speaker settings. Make sure on the drop-down menu of each, that the IO2 device is selected and not your internal sound card. You can test the sound levels using the handy meters under the microphone and speaker settings. This will ensure you have good levels going to and from your call. You may have to tweak your gain and master levels on the IO2 device to obtain a good level. This is also true for the levels coming and going to the soundboard. You may have to tweak the Aux/Effects feed and inputs. To ensure everything is working you can place a Skype test call. This option is in your contacts list. 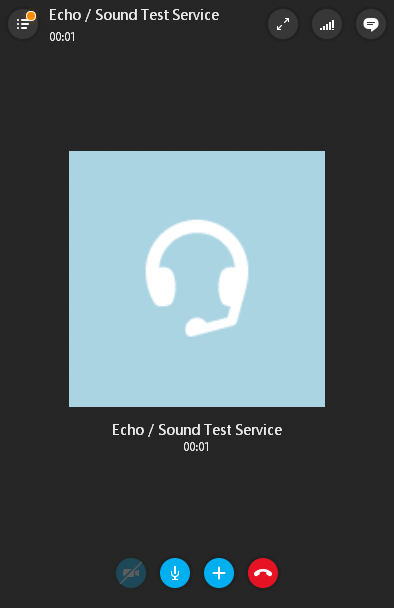 The contact is called Echo/Sound Test Service. This will allow you to place a test call to Skype, record a message and have it played back to you. This will ensure that everything is working properly. Using Skype for a conference call or presentation is an excellent way to communicate with those who could not make it to your presentation. This setup can also work with other conference style software and is not just limited to Skype. So next time you have a conference call or presentation and you want it to sound professional, try using this method. It can make you look and sound good.